Enticing. Tempting. Engaging. Where exceptional cuisine meets unmatched views. Welcome to a destination dining venue, set in the heart of the Dubai Marina, one of the worlds most vibrant and glamorous waterfront districts. International dishes bursting with Spanish, Moroccan, French and Italian flavours are complemented by fashionable surroundings in the restaurant or on the terrace as you delight in a shisha under the stars with views across the Marina. Indulge in dinner and drinks al fresco at the Dubai Marriott Harbour’s stylish indoor and outdoor haven, Azur. 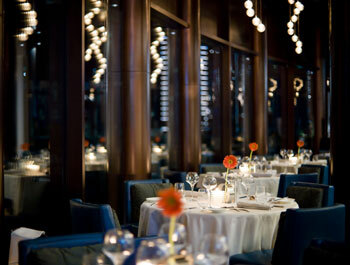 Serving inviting dishes that tempt taste buds, Azur offers a stylish, seasonal setting with authentic cosmopolitan views. Whether you find yourself dining indoors in the vibrant blue hues of the restaurant or enjoying a shisha under spectacular stars, one thing is certain: nothing at Azur will disappoint. Perched on a magnificent terrace and boasting unparalleled views, Azur offers a unique dining experience. At sundown, patrons can catch sight of the last yachts as they come into the marinas. By twilight, shadows deepen and lights glow on the waters of the majestic Marina quays. Azur boasts a unique approach to dining, and while the venue is the epitome of relaxed, the menu offers innovative, cutting-edge cuisine, prepared by the hotel’s top kitchen team. Where exquisite dining blends seamlessly with a casual, friendly night out, Azur offers the best of all worlds and occupies a unique space among Dubai’s open-air restaurants.